The crowds and hype of South By Southwest make the massive Austin tech and media conference the perfect place for launching, well, any sort of app that needs crowds and hype to break out of tech circles and into the mainstream. 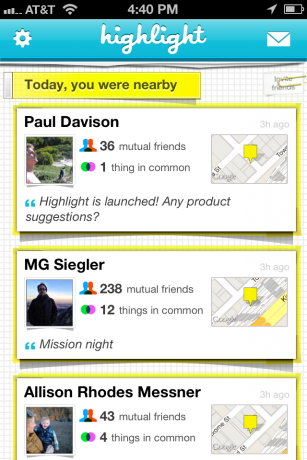 So what can we expect to blow up next week, like Twitter, Foursquare, GroupMe and Beluga have in past years? Highlight is what I’m placing my bets on — and not for what it is today, but for what it could become. That is, the long-sought replacement for business cards. The new background location app got my attention at the beginning of February because it made it easy for me to find old friends and meet new ones without the friction of checking in. But some of you are going to prefer Glancee, because it has a tighter privacy focus, a subtle but smart algorithm for matching to nearby friends, and a beautiful design. Other people are likely to just stick to Foursquare — which is killing it these days — or maybe just Facebook Messenger (which Beluga became). Or maybe one of the dozens of other location apps that have their own ideas (or cloned ideas) for how to connect people in close proximity. Relentless early adopter Robert Scoble has also taken a close look at each, and last weekend declared them the up-and-comers at SXSW this year. I agree — and actually meant to write a post about it, but he beat me to the punch ( for you, Scoble). In an in-depth article for The Next Web last weekend, he sketched out three key reasons why these apps are special. By having them turned on and running in the background of your phone, they can help you find people to hang out with, learn more about nearby strangers, and tell you when your real friends are near. All true, but there’s something bigger going on. These apps are enabling types of long-term connections that nothing else has yet, which in some ways is like remote contact sharing service Bump. This vision hasn’t manifested itself yet, but you can see the signs in the update that Highlight in particular says it’s going to push next week. Check out what founder Paul Davison said on Thursday, when he announced his new funding round. We want Highlight to make Austin even more fun for you – by surprising you with hidden connections, surfacing information about the people you meet, and helping you remember these people when you bump into them at a random New York coffee shop a year later. Wait, what? Wasn’t he just supposed to be talking about South by Southwest? No. He’s talking about building a new social network on top of Facebook, the key source of user data for both his app and Glancee. This is what is going to make Austin so interesting next week. Highlight could create new value for users when they go back home, and that’s what fundamentally needs to happen when we all take our hungover flights back home. Instead of the normal business card swapping that happens at the event, it’s sounding like Highlight is going to get some sort of feature for marking and saving the favorite people you meet in person. Thinking through the New York coffee shop scenario, imagine seeing a notification that says “You met Robert Scoble at the Trendy Startup BBQ party in Austin. Now he’s two blocks away at a bagel place. Go say hi!” Instead of just using mutual friends and Liked Facebook pages to determine relevancy, Highlight is getting a new layer of behavior data. And boom, business cards would be dead. Forget stuffing your pockets full of cardboard at a party, going back home, throwing them on your hotel room dresser as you pass out, and forgetting them when you have to rush out the next morning to catch your flight. You’d just mark the people you want to stay connected to right when you meet them, and then at your convenience connect with them later. Here’s a little more evidence for that sort of experience. As I’ve used Highlight in San Francisco over the past month or so, I’ve found myself scrolling through to see who’s nearby, ignoring any messages from interesting people as I continue working, and then going back hours or days later — and geographically far from where I’d made the connection — and continuing the conversation. As I’ve said before, this has already connected me with old friends, introduced me to new people, and gotten me stories for my job. So hang on to your phones, folks, because they’re going to be all you need to create a new and lasting network of friends. Note: One of Highlight’s new investors is the CrunchFund. And while the partners are friends, and its largest limited partner is our parent company, AOL, I have no financial stake in the firm and TechCrunch only covers its investments when we think they’re good (not all of them) — same as any other investor who we know. Feel free to discuss with me in the comments.